As we head into Week 8, it’s time again to look at our top IDP streaming options for fantasy football. Week 7 saw another slate of solid IDP streamers especially for our linemen. Colts end Kemoko Turay got to the quarterback three times, resulting in a sack. Jags end Dante Fowler also recorded a sack despite playing alongside a healthy Calais Campbell. The rest of our streamers didn’t have a ton of big plays but did record solid tackle numbers, including Saints linebacker A.J. Klein, who led New Orleans with seven. Bills safety Micah Hyde recorded five tackles, which is his second-most in a game all season. Our only two duds were Chargers end Isaac Rochell and Bills linebacker Lorenzo Alexander, who saw one tackle between them — but that’s the risk you run when you stream players who don’t see the same snap counts as others. Let’s see who’s on this week’s slate of streamers as we cross the halfway point of the season. Opportunity. Opportunity. Opportunity. That’s what makes Tuitt an appealing streamer this week. He draws the Browns, who are currently second in the league in 72 offensive plays per week, 10th in 38 pass attempts per game, and, juiciest of all, lead the league in sacks per game allowed with 4.4, including five in each of the last five games. With Tuitt playing more than three-quarters of the Steelers defensive snaps, he’ll have plenty of opportunity to get to the quarterback. Couple that with him averaging 2.5 quarterback pressures every game this season and the chances are good he records a sack. Between returning from an injury that cost him the first two games of the season and not producing a ton of fantasy stats, there’s a good chance Golden is still available to stream. However, he has quietly been one of the more productive pass-rushers this season in his limited time on the field. He’s created 11 quarterback pressures on just 60 pass-rushes this season — his pass-rush-productivity rating ranks in the top-five of all edge rushers, besting household names like Khalil Mack and Von Miller. Golden and the Cardinals face the 49ers this week in a pass-rusher’s dream matchup. Not only do the 49ers allow 3.9 sacks per game, good for second-worst in the league, but they continue to roll out quarterback C.J. Beathard, who’s been sacked 14 times in his four starts this season, including seven last week. Now is as good a time as any for Golden to turn this productivity into fantasy results. As recently as 2016, Davis was a perpetual 100-tackle linebacker, achieving that feat in five consecutive seasons. But a decline last year to 76 tackles combined with him turning a year older (he’s 35 years old now) no doubt turned people away from drafting him for their IDP team. A four-game PED suspension the first four games of 2018 didn’t help either and most likely meant he was available in most every league. But despite all that, the Panthers threw Davis right back in the fire, playing him on 90% of the defensive snaps his first two games back where he recorded six and five tackles to go along with two passes defensed. Davis will now get the Ravens in Week 8 where he’ll see the most opportunities for tackles all season. Currently, the Ravens lead the league with 74 offensive players per game, which means Davis will have a good chance to exceed his season-high. The Ravens are also second in the league in pass attempts with 44 giving Davis opportunities to build on his two passes defensed for the season. Reggie Nelson and Karl Joseph are the bigger names in the Oakland secondary, but it’s actually Gilchrist who has not only led the unit in snaps this year but also tackles with 27. It’s not a big number, but that just means Gilchrist should be available in most IDP leagues. And if there’s ever a week to use him, it’ll be Week 8. The Raiders play the Colts, owner of a league-high 44.6 pass attempts-per-game. They turned out to be good medicine for our streamer last week — Micah Hyde — who turned in his second-highest tackle total of the season. The Colts passing game should be just as good for Gilchrist too. He’s averaged 2.5 targets thrown his way this season and should see more than that against the Colts. Better yet, Andrew Luck is tied for third-most interceptions in the league with eight, giving Gilchrist ample opportunity for passes defensed or, better yet, a pick. I don’t really understand why Joyner isn’t started more in IDP leagues by now. He’s coming off a season with nine passes defensed and he’s seen nearly 100% of the defensive snaps this year playing for a good defense. And because of the shellacking the Rams offense puts on teams, their opponents are often playing from behind and throwing it more. To that end, Joyner has recorded at least five tackles in four of the Rams seven games this season. Next up for Joyner and the Rams are the Packers, who are currently third in the league with 43.7 pass attempts per game. Furthermore, the Packers offense continues to be a blessing for opposing secondaries as the top two tacklers in four of the Packers’ six games this season came from the opposing secondary. This means that Joyner can still turn in a fantasy-relevant game while taking nothing away from fellow safety John Johnson, who’s currently second on the team in both tackles and passes defensed and, most likely, already taken in your IDP league. Thanks to being unsigned the first month of the season, Reid was off many IDP radars. 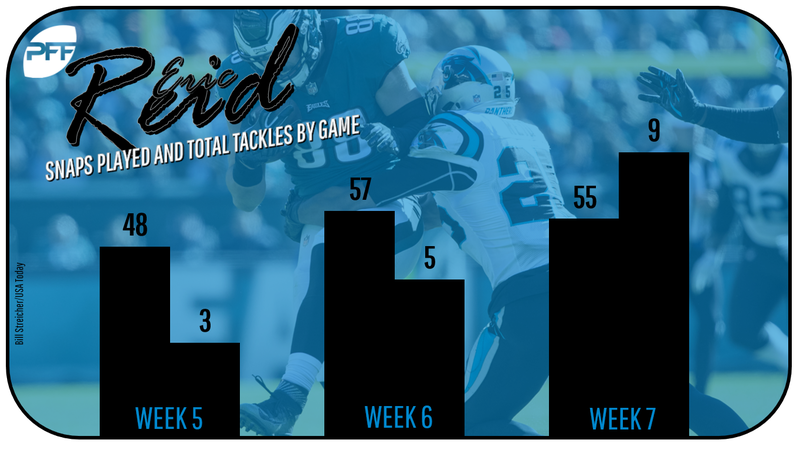 But since Week 5, he has seen over 80% of the Panthers snaps while his tackle total has gone up each game, from three to five to nine. Reid, along with the aforementioned Thomas Davis, plays the Ravens this week and their second-in-the-league 44.1 pass attempts per game. Reid hasn’t been very good in coverage this year, allowing five receptions on all five targets his way but all that means is a tackle on his fantasy ledger rather than a pass defensed or pick. Between the number of plays the Ravens run and how much Reid is on the field, he’ll be a good bet to see the ball plenty.